Most Australians have now finished school or are on a break from work, ready for a season of yummy foods, drinks and overindulgence through parties, Christmas and the New Year. While treats and special occasion foods can add variety and enjoyment to our diets, unfortunately many of us are already eating poorly as a regular practice. Each week, Australian adults eat 17 or more serves of alcoholic beverages, chocolate, sugar-sweetened drinks, cakes and biscuits, processed meats and savoury snacks such as crisps. Of the 35 serves of vegetables adults are recommended to eat per week, at best Australians are having only 25 (men) and 29 (women). One serve is half a cup of vegetables or one cup of salad. How can I eat better at Christmas? Regardless of how healthily you normally eat, it’s useful to have a plan of attack in periods renowned for dietary excess. Based on what we know about typical Australian eating habits, here are ten festive season survival tips for better health. Alcohol contains a lot of kilojoules (1 calorie = 4.2 kilojoules), so try setting yourself an alcohol limit before arriving at a party or social function. A good strategy is to alternate alcohol with water, soda water or diet soft drinks. To keep your sugar intake down, switch sugar sweetened drinks for diet options, or better still, water. It can be a mistake to arrive hungry to a function offering cocktail food. The temptation to shove lots of yummy treats in your mouth is hard to resist! The ideal option is to eat a healthy meal beforehand. Aim for plenty of salad or vegetables, some lean protein (meat, chicken or fish) and a small side of wholegrain carbohydrates (for example, half a cup of cooked brown rice). Dietary proteins leave us feeling fuller for longer. Not all canapés are created the same. If you are eating at the party, look for lean protein-based choices, such as meat balls, prawns, lean meat skewers, sushi, cold rolls or frittata. Avoid fried and pastry-based morsels. It’s difficult to keep track of how much you’ve eaten when enjoying finger food. 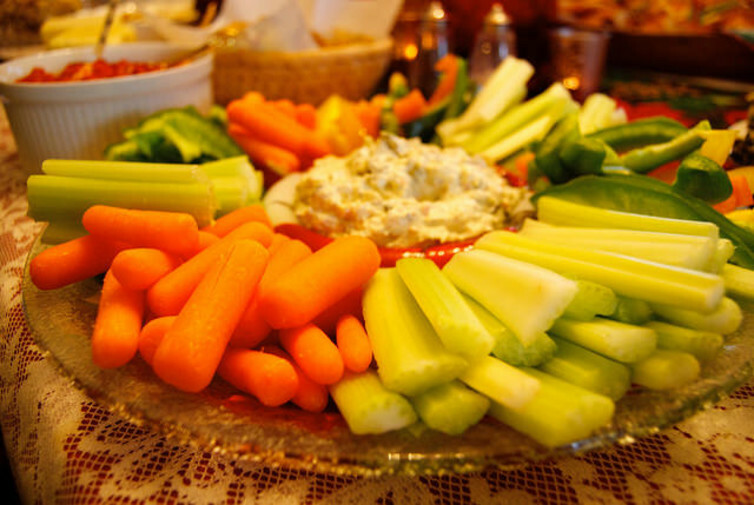 If grazing from a platter, go for the vegetable sticks in preference to crackers, and choose hummus and vegetable based dips. If cheese is your thing, focus on quality rather than quantity, and consciously cut thin slices. Cheese is high in kilojoules. There’s no need to miss out on delicious meals when eating at a restaurant. A simple way to prevent kilojoule overload is to limit yourself to one to two courses, for example entrée and a main, mains and a side salad, or main and dessert. Instead of carbohydrate-heavy pasta, pizza and rice-based dishes, select main meals that include lean protein foods, and salads or vegetables. Burgers are often a good source of protein, and you could just eat one half of the bun if it’s a large serving size. To avoid unhealthy fats (and too many kilojoules), it’s best to steer away from deep fried offerings such as chips, wedges, battered or crumbed fish or calamari, and schnitzels. Many curries can contain hidden fats and kilojoules too. Choose steamed vegetables or salads if you order side dishes and not fried chips, wedges or mashed potatoes. Vegetables contain essential vitamins, minerals, phytochemicals, loads of fibre to fill you up and hardly any kilojoules. Regular vegetable intake is associated with lower risk of cardiovascular disease and certain cancers. So load half your plate with a rainbow of vegetables and/or salads and get munching. Most of us have a soft spot for something sweet or salty. Admitting this is important! Whatever your weakness, it might be best to not eat any at all, as stopping after you have had some may be harder than resisting altogether. Sausages and other processed meats contain saturated fats, salt and preservatives, and high intake is linked with elevated risk of bowel cancers. 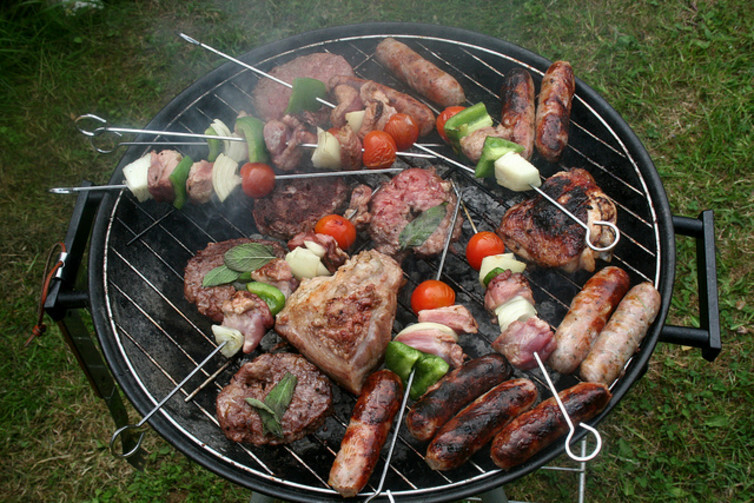 At BBQs, switch sausages for hamburgers made using lean mince, or lean meat skewers. If you fancy dessert, offer to share with someone, or look for fruit-based options. Added sugars in foods are a source of “empty kilojoules”; they give our bodies energy but very little in the way of nutrients for health. Frequent sugar consumption can also lead to tooth decay. Be conscious of the number and type of snacks you consume between meals, as it’s easy to lose track. Instead, make the most of delicious and seasonal summer stone fruits, cherries and berries. Leave rum balls, mince pies, ginger breads and puddings as an indulgence for Christmas day. If you can’t face a 10-step approach, keep it simple this summer. Think about the three junk foods or drinks you are most partial to, and halve the amount you consume. And while you’re at it, double your vegetable and salad habit. Serious tactics are often needed to manage prickly relatives and awkward gifting moments during the Christmas period. Taking the same approach and applying it to your eating habits could have you enter the new year feeling great. Get a snapshot of your own dietary habits by completing the free CSIRO Diet Score survey – it takes about 10-15 minutes, and you will be given your three biggest areas to improve on once completed.